Vinyl playsets are durable and low-maintenance. Our premium, vinyl playsets are five times stronger than traditional, wooden playsets. Each set is manufactured with an eye towards durability and includes a 20-year limited warranty. Natural, durable, and environmentally friendly. Southern Yellow Pine is a strong, versatile species of wood and is used for our wooden playsets because its quality and durability remains unmatched. Our wooden sets come with a 5-year limited warranty. Playset options for your backyard living spaces. Think back to that exhilarating feeling, the wind blowing through your hair as you swing higher and higher with your toes pointed up to the sky! There’s just nothing quite like a swing set! We are here to make this happen again for this generation of kids that are quickly growing up. So bring the magic of play into the perimeters of your backyard when you choose a swing-set that encourages your child(ren) to explore ways of learning through doing. An intentionally created swing set is a great way to jump start your child(ren) into being the next generation of innovators and world leaders through the imaginative play and creativity made possible by your backyard play area. Remember childhood is a time for lively imaginations and spirited adventures. And it is also the time to build a strong foundation for active and healthy lifestyles. With our swings sets you can combine the fun of childhood with the fulfillment of physical and developmental needs to deliver learning through play. The healthy habits that are fostered by enjoyable exercise may be one of the only things more durable than a swing set form FAMILIES. Your child’s hours of fun in the backyard are an important part of their growth and development. Be creative as you create a unique swing set for your family! For loads of fun and family time count on FAMILIES. As a family operated supplier of swing sets we strive to provide fine quality, affordable, swing sets that adapt to the activity needs of various ages of children. Our swing sets are loaded with activities that will spark every child’s imagination and encourage physical activity coupled with never ending fun and lasting memories. With accessories that range from infant swings to handicap swings, clubhouses to water tight playhouses to handicap accessible houses, to tube slides and rock climbing walls, ship’s wheels to hand bars, you can design a set that will grow with your family and meet their specific needs. Because of the multiple options we have to pick from, having fun will be as simple as stepping out of your house. 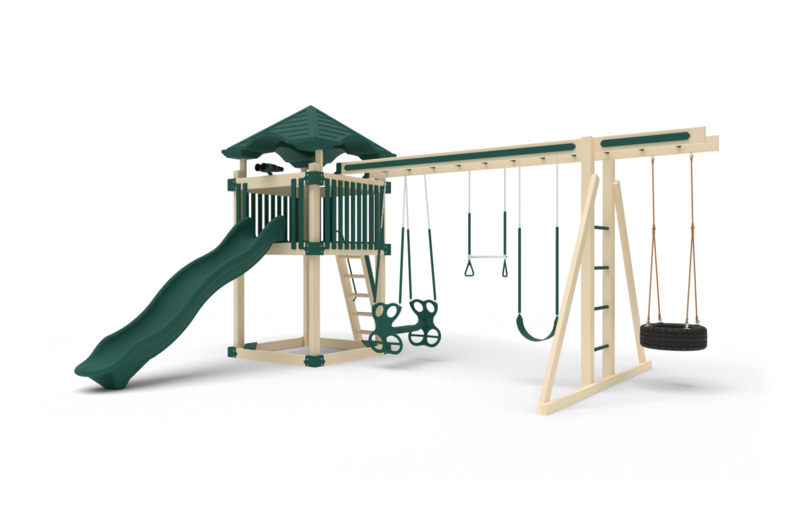 Give us the dimensions of your play area and we will help you maximize the options for learning and growth as we bring great style with our swing sets and help multiply the fun in your backyard. With our assortment we have the ability to customize a set for nearly any size backyard. For larger yards it is always fun to start with a double deck then customize with climbing elements to keep everyone moving. Having a swing set is an easy way to increase exercise and provide enjoyment for children of all ages. Choose a playhouse with doors and windows to create a special place of their own to call home in the backyard and give their imaginations room to grow. Keep in mind that every day will be different as your child explores ways to enjoy the equipment you provided. And don’t forget that a swing set is a way to encourage a lifetime of creativity, so utilize as many options as your space and budget can squeeze in. Do you need to prepare your yard before we come? In most yards we need to dig with a shovel at either end of the play set to install properly. We will use a trained eye to place it. However any site preparation is the customer's responsibility. We are glad to discuss any questions you may have about the suitability of your yard. What if you have a fence? Because all clubhouses come pre-assembled we need to have a 5' to 8' wide access to your backyard. If you do not have this, talk to us about other options particular to your home. What are your boundaries of space or budget? We've helped parents and grandparents stretch resources of land and finances to their best advantage, pondering together dreams and hopes for backyard fun. Need some ideas? Stop by or stroll through the options we have pictured. We are able to accommodate your specific swing set and budget needs. Do your children like to Climb? Swing? Play in the fort? Use these answers to choose a swing set configuration that builds on their strengths and encourages them to achieve new skills as they grow. Choosing a swing set that is interactive will insure many years of developmental play. We are glad to answer your specific questions, guiding you through the maze of what to put in your yard. We realize as children grow their needs change, yet expand along the same lines. What you begin to encourage a toddler to do, he will someday attempt, then master, and aloha! show someone else how. Orders can be placed at either of our Sales Lots or by phone, email, and mail. We will verify your order by phone before processing it. We request a 20% deposit when order is placed, the balance being due on delivery. This includes delivery within 20 miles. Additional delivery miles are quoted with a flat rate per mile/one-way. What does our installation include? 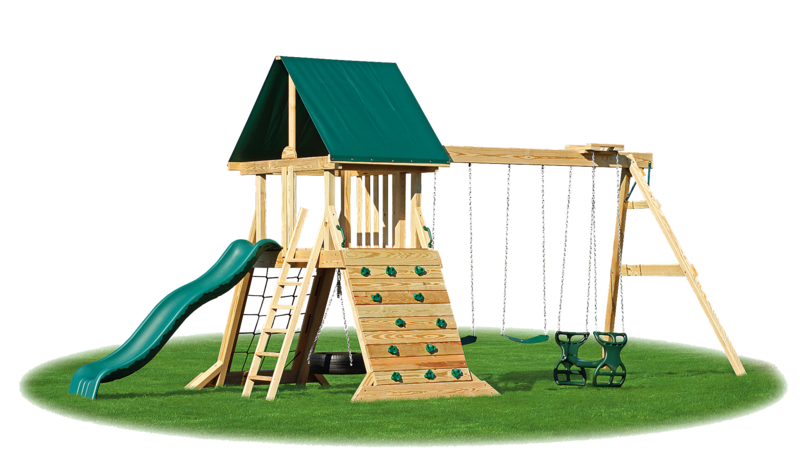 We will place the set in your yard, assemble all the components, secure it, and have it ready for many hours and years of play when we leave. We consider it wise to make use of resources around us to take care of the world. Wherever possible we use high quality recycled materials in our swing sets. You can feel especially good about your choices, knowing you are helping our environment, while at the same time giving your child the ultimate quality in outdoor enjoyment. And finally, you can be assured that we are here to serve you! For over 20 years we have been listening to you our customers and watching your children play, we are glad to make suggestions and help you determine what might be best for your child(ren) based on our knowledge and experience of the products we have to offer. We affirm the parenting goal to provide a home where our children learn truth, have fun and treasure life. Playgrounds serve as a tool in a child's development. So in the midst of preparing, selecting and purchasing your swing set never forget that ultimately, treasuring and nurturing your children throughout the years is the best thing you can ever do for them! Head to one of our Sales Lot’s and play with your child(ren). Learn about your child as you watch them play. Take the time to notice what they are drawn to. Discover the things that make them giggle and squeal with excitement. If it is you pushing them on the swing, be sure to include a swing. If it is sliding down the slide, consider which one they like best. If it is doing the monkey bars, those can be included on any swing set! You get the idea! Whether you have 20 minutes or all day, simply put, come out and take the time to enjoy being with your child(ren) as they discover and imagine… and in the process you will begin to recognize the specific elements of a swing set that makes it fun and educational for them!! Once again, we are here to help you in selecting the best options for your family, your backyard, and your budget. We have a ‘No Pressure Policy’ so come and dream about what you would like to have in your own backyard. Get a few quotes so you know what your swing set will cost; it really is an investment in your child(ren’s) future. And above all, enjoy your family and then your swing set for many years to come!